Hello from snowy Big Bear! Thanks for checking in with us regarding Big Bear real estate. Let’s dive right in and get caught up on what has been happening in Big Bear real estate market. 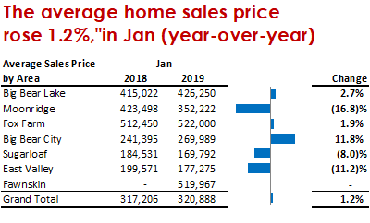 2019 started on a positive note: The month of January saw an overall increase of 1.2% in average price ($320,888 in 2019 vs. $317,206 in 2018) However, as the chart to the right illustrates, results by area varied: Big Bear City saw an 11.8% increase in residential sales price; whereas, the average price in Moonridge declined 16.8%. 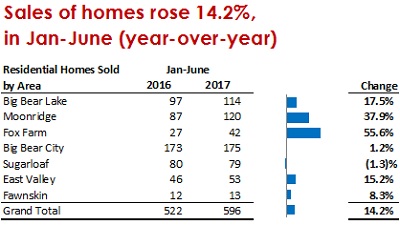 We will keep an eye on this going forward, but, with fewer homes selling in the winter, one month certainly does not make a trend. 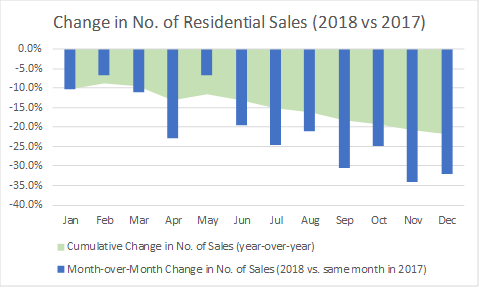 Residential sales for January remained relatively flat overall (77 in 2019 vs. 78 in 2018) with Big Bear Lake ‘proper’ showing the biggest decline in number of sales, and the Fox Farm area showing an impressive gain (percentage wise anyway). Also interesting to note is the change in number of sales in the $250,000-$499,000 price range vs. what in years past was the more liquid ‘meat and potatoes’ price range of $0-$250,000. 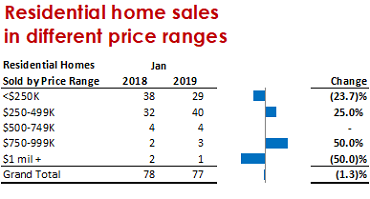 As prices over the last few years have been on the rise and demand moves to meet the market, the role these price ranges play in our market has reversed. This sudden, substantial and mostly supply-driven price jump, combined with the mid-year increase in interest rates, caused the number of transactions to stall in June. 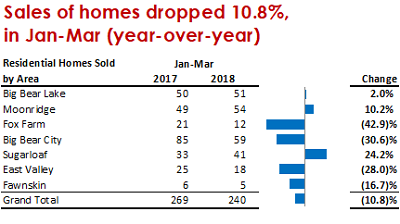 And from there, residential transactions began to slide, even crawl at times, towards the finish line as the year progressed. 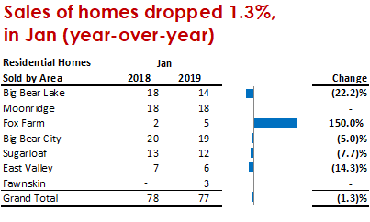 In summary: For the full-year 2018 vs. 2017 the average price gain retreated to +3.3% for the year. 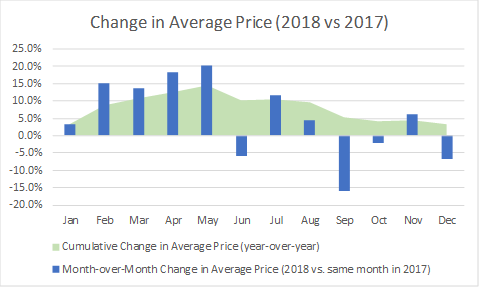 So, although much of the gains seen early in the year were given back, prices did indeed increase here in Big Bear last year. Interest rates, for the time being anyway, have settled back down and motivated sellers who are willing to meet the market, are seeing strong offers as we begin 2019. Hopefully all the wonderful rain and snow we have been getting will continue into spring allowing our lake to re-coup some much needed water. The current lake level as of 2/4/19 is 16’9” from full. Whereas on on 11/26/18 it was 18’5” inches from full…progress. And our most recent storm (which brought lots of new snow!) isn’t included in these totals. Good news there, as our lake filling up is great for the Big Bear Valley and also for our real estate market. If you are considering a sale in 2019, late winter into early spring is a great time to get a jump on the competition. 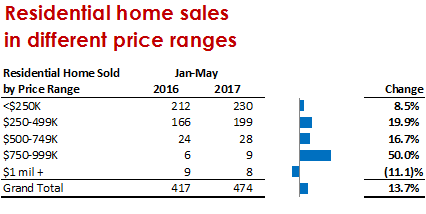 In fact, looking back at last year, this was the optimal time to list and sell. Do let me know if you have any questions on the market, on your property’s current value, or on any properties you see for sale here in Big Bear. Until next time: All the best and think snow! Posted in 2019 Posts on February 7, 2019 by Mike Sannes. Hello from Big Bear and thanks for checking in with us regarding Big Bear real estate. There is quite a bit to catch up on since our early summer update, so let’s dive right in. Posted in 2018 Posts on November 9, 2018 by Mike Sannes. Hello from Big Bear and thanks for checking in with us regarding Big Bear real estate. As we are already over five months into 2018, let’s dive right in and catch up on the happenings in the Big Bear real estate market. Posted in Uncategorized on June 15, 2018 by Mike Sannes. Hello and thanks for checking in with us regarding the Big Bear real estate market. The first quarter of 2018 is in the books, so let’s take a look at what transpired and what to expect going forward. Big Bear’s unique resort home market, like all markets, is driven by supply and demand. The story in Q1 of 2018 was on the supply side. The lack of quality inventory in our market overall had two main effects. Posted in 2018 Posts on April 19, 2018 by Mike Sannes. "Wow" is one of the first words that comes to mind when looking at what transpired in the 3rd quarter in Big Bear's real estate market. Historically, the 3rd quarter is always the busiest of any given year, but this year... wow. Posted in 2017 Posts on October 10, 2017 by Mike Sannes. Hello and thanks for checking in with us. It is hard to believe, but almost half of 2017 has already passed us by, so let’s get caught up on the Big Bear real estate market. Posted in 2017 Posts on June 16, 2017 by Mike Sannes. Hello and thanks for checking in with us on Big Bear’s unique, resort real estate market. The first quarter of 2017 is in the books, so let’s take a look at what has transpired in Q1 of 2017. Posted in 2017 Posts on April 17, 2017 by Mike Sannes. Hello and thanks for checking in with us regarding the Big Bear real estate market. It is hard to believe, but the first quarter of 2017 is already more than half way complete. So let’s get caught up on what has been happening with Big Bear’s unique real estate market shall we? January in Big Bear has historically been a month where we see sales begin to slow, as there are typically fewer homes on the market in the winter months as well as fewer home buyers in the market. January 2017, however, seems to have bucked this tren d as there were 86 residential closings as compared to 66 in January 2016, an incredible 30.3% increase! In fact, the 86 closings we saw this January are the most sales we have seen in the month of January in over 10 years. Posted in 2017 Posts on March 2, 2017 by Mike Sannes.